Latest in a number of outstanding pieces of English furniture to surface and succeed at provincial auctions was this pair of satinwood inlaid demi-lune card tables, above, offered at Stride & Son (20% buyer’s premium including VAT) at Chichester on March 31. 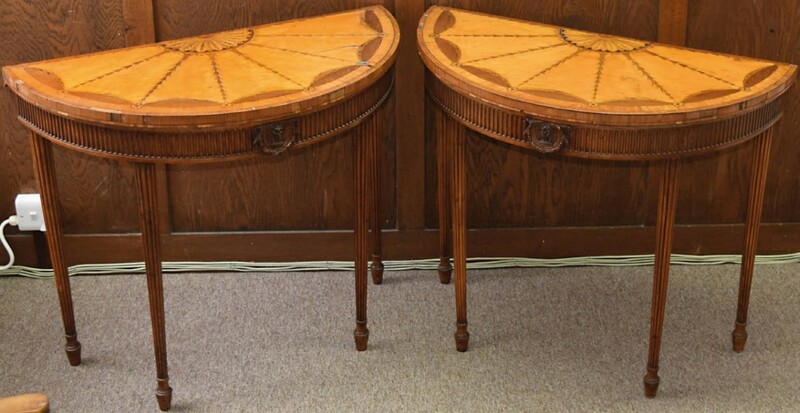 A pair of card tables ‘in the manner of Ince & Mayhew’ – £36,000 at Stride & Son. The estimate was £800-1200 and the catalogue notes described them as George III with later additions. There was a 19th century fashion for making pairs of tables such as this into a single centre table – work that was later undone when the pair came back into vogue. Here it appears the legs, with a double gate leg action, were later additions. However, the pair was very much in the manner of Ince & Mayhew whose Soho workshops flourished between 1783 and 1809. They attracted huge interest and “on the day nine telephone lines were booked and there was also Irish interest in the room,” said auctioneer Peter Parker. They sold sold to the London trade at £36,000.